The Army has for years been successful at creating senior leaders adept in the art and science of land combat after honing their leadership at the direct and organizational levels. While those experiences remain invaluable, undue reliance upon them to create the Army's future institutional leaders is increasingly risky in today's rapidly changing world. The contemporary and future operating environments demand an innovative and highly adaptive Institutional Army, capable of rapidly responding to operational demands. Incremental adjustments to current senior officer management practices will not create that adaptability. An entirely new approach is required, one that unleashes the unique potential of each person—full-career officer talent management. Senior leaders are told in doctrine that they must lead and manage change. But apart from some popular models for the process of change, there are few how-to guides for leading change in the unique context of military organizations. Moreover, popular change management texts focus on initiating change, and less about inheriting and sustaining change efforts already happening in the unit. This how-to guide draws from a wide range of organizational literature to provide a comprehensive set of questions and guidelines that senior leaders should answer as they navigate change efforts and work to improve their organizations. Few if any American officers performed a wider array of strategic functions as Dwight D. Eisenhower--he was a staff planner in the War Department, wartime commander of a massive coalition force, peacetime Chief of Staff, and Supreme Allied Commander in Europe. Eisenhower was directly involved in a number of major transitions including the building of the wartime American Army, its demobilization following the war, and the resuscitation of American military strength during the initial years of the cold war. This means that Eisenhower's career can provide important lessons on how a coherent strategy should and should not be built during times of strategic transition. That is what this monograph begins to do. It is not intended to be a biography in the usual sense and thus offers no new facts or insights into Eisenhower's life. Instead it uses that life as a backdrop for exploring the broader essence of strategic coherence and draws lessons from Eisenhower's career that can help guide the strategic transition which the U.S. military now faces. The successful application of national military strategy depends upon the existence of a balanced, flexible military establishment; a national force structured, manned, equipped, and trained to execute the broad range of potential missions that exist in the post-cold war world. With this in mind, the national leaders of the previous administration developed a concept for a military that was considerably smaller; but well-equipped, highly trained, and capable of rapid response to a number of probable scenarios in the final decade of the 20th century. 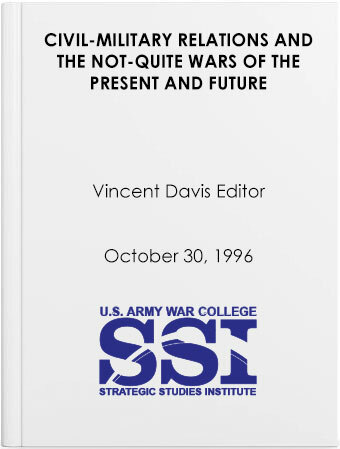 The author's masterful assessment of the processes by which these plans for the future state of America's armed forces were developed is a valuable addition to the literature on strategy formulation. Working with a great deal of original source material, he is able to illuminate the critical series of events that resulted in the development of the National Military Strategy of the United States and the "base force." He comments upon the roles played throughout this process by the Secretary of Defense, by the Chairman of the Joint Chiefs of Staff, and by the Service Chiefs. He assesses the extent to which the "build-down" has been achieved since the concept was approved, and how the process was affected by the Gulf War, domestic needs, and, to a lesser degree, by a change in administrations. Over the course of the next six months, the Strategic Studies Institute will examine the impact of the media's technological advances on strategic and operational level planning and policymaking, first in an overseas theater, and subsequently on decisions made at the national level. The first of these two studies recognizes the complexity of executing military operations under the scrutiny of a very responsive, high technology world news media. Given the volatile, unstable, and ambiguous environment in which armed forces can find themselves, the actions of field forces have a greater chance than ever before of affecting subsequent strategic decisions made at higher levels. The pressure on field commanders to "get it right the first time" is demonstrably greater than ever. The author intends that these thoughts provide commanders with an understanding of the high technology and competitive news media environment they can expect to experience and offers specific suggestions for successfully communicating with reporters. This essay develops a simple, yet comprehensive definition of strategic art. Strategic art entails the orchestration of all the instruments of national power to yield specific, well-defined end states. Desired end states and strategic outcomes derive from the national interests and are variously defined in terms of physical security, economic well-being, and the promotion of values. Strategic art, broadly defined, is therefore: The skillful formulation, coordination, and application of ends (objectives), ways (courses of action), and means (supporting resources) to promote and defend the national interests.